The approximately 520-meter-high Tibidabo is the highest mountain in the Collserola mountain range and shields the city from the weather of the hinterland. 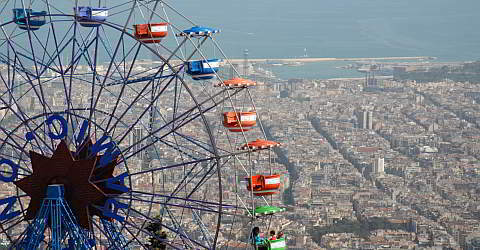 The Tibidabo is worth it alone because of its breathtaking view. On a clear day, you have a vision to Montserrat. One legend is the name Tibidabo to the devil who wanted Jesus to lead into temptation. He said to him: "Haec omnia tibi dabo si cadens adoraberis me", English for "All this I will give you if you kneel down". Even the trip to Tibidabo is a pleasure. Take the subway line with the L7 to the terminus Avinguda del Tibidabo. Then change into the Tramvia Blau, the blue tram. The Tramvia Blau has been the only tram in Barcelona for long time and is still absolutly unique. From the terminus of the Tramvia Blau change for the last piece into the cable car up the Tibidabo (€4.60 return ticket). During the winter months, the Tramvia Blau only drives on Friday through Sunday, but only a few meters above the valley stop is a bus station (bus 196). From the mountain station of the Tramvia Blau must be involved in the cablecar (Funicular) (return: 3.00 €). The bus also stops at the cablecar station. As an alternative offers the Tibibus, which runs every 20 minutes from Plaça de Catalunya to Tibidabo. The bus T2A operates on days on which the parc is open from 10.15 every 20 minutes. At the top station of Cablacarca which leads to the top of Tibidabo, is the Parque d'Atracccions. The amusement parks offer a few good round-about, Ferris wheel and roller coaster with similarly grandiose views. Attractions also include the vending machine museum Museu d'Automates del Tibidabo on the grounds of the amusement park. Not far from the amusement park is the church Sagrada Corazón which was copied to the Sacre Coeur in Paris. The basilica was completed in 1961. On the ground floor of the Sagrada Coazon there is a church space from the period of around 1900. One level is about the actual, built in Gothic style basilica with a small square. One of the towers you can take the elevator up. The basilica is crowned by a statue of Jesus. Until well into the hinterland, you can see if you visit the viewing platform of the Torre de Conserolla. On a clear day the view extends to Montserrat. The tower was used for the Olympic Games in 1992 and is 268 meters high. The architect of the construction of steel, concrete and glass - you go to the viewing platform at a glass floor - was the Englishman Sir Norman Foster, all over the world for the establishment of representative buildings involved. You come to the Torre de Conserolla from the mountain cable car station on weekends with a small tourist train or by bus line 111, which conects the Tibidabo with the Conserolla Tower. Alternatively, if you first want to visit the tower, you can use the F.G.C. (Calatan transport companies, integrated in the metro network of Barcelona) line S1 or S1 to station "Peu de Funicular" and proceed with the funicular up to the mountain station. This is situated in the small village Vallvidrera. To the tower there are about 500 metres to go. If you are set up, you should wait until weather is clear, if it's not hazy and the view is really terrific. Try also the sunset once the Tibidabo experience. You can find the opening times on the website. Admission free for for the over-60s with no access to rides, shows or activities. Special rates for seniors, handicaped and families. Free admission with the Barcelona Card.